Midtown, Cleveland - Cleveland is ranked 12th out of the nation's Top 20 cities when it comes to year over year growth in tech jobs, according to ZipRecruiter.com. One neighborhood in particular is playing a leading role in that growth. Midtown, once full of blight, is coming back to life in a big way. The neighborhood, which sits between downtown and University Circle, is quickly establishing itself as one of the hottest high-tech corridors in the country. There are millions of dollars in projects slated to come online in this neighborhood including a "tech hive," a hotel and residential housing. "This corridor has seen a lot of disinvestment for a lot of years," said Jeff Epstein of MidTown Cleveland. It all started at East 70th and Euclid, the corner that is helping drive redevelopment in this Cleveland neighborhood. "Dramatic growth of interest in being in this area," said Epstein. The restored Baker Electric building is now home to several new high-tech companies, including Vizzle, which produces education software for autism and special needs students. One Midtown Luxury Townhomes - Contact Zachary Nicolay, 216-973-6484, Keller Williams Greater Cleveland. Midtown, Cleveland -- Dean Mueller is the car guy. A Porsche 911 by Singer guy, to be precise. His brother, Scott, is the art guy, the curator of a collection waiting to be mounted on the walls of a century-old building in Cleveland. Together, the siblings have turned a third-generation Cleveland family business into a $1.5 billion enterprise. And they've done it with little fanfare, eschewing attention while refining the mix of old-fashioned salesmanship and newfangled technology that drives Dealer Tire LLC. The privately held company manages replacement-tire and maintenance-parts programs for more than 10,000 car dealers, spanning two dozen automotive brands. Dealer Tire employs upwards of 450 people at its headquarters and twice that number across the country. Last year, the Muellers committed to locating a new headquarters in Midtown Cleveland. Their decision to lease the long-empty Victory Center, a historic structure at the heart of the city's Health-Tech Corridor, is likely to have broader economic reverberations. One Midtown Luxury Townhomes - Contact Zachary Nicolay, 216-973-6484, Keller Williams Greater Cleveland. Midtown, Cleveland—Thirty-five years ago, Midtown pioneers Morton Mandel, chairman of Premier Industrial Corp., an automotive and electronic parts supplier, and Thomas Roulston, president of the Roulston & Co. financial firm, decided it was time spruce up the ragged industrial district between downtown Cleveland and University Circle that was home to their businesses. In the two decades since, however, Midtown's business base has grown, spurred by biotech spinoffs of University Circle's health and medical institutions, and the conversion of older, lower-rent downtown office buildings into apartments is making Midtown more attractive for service businesses and nonprofits. And the organization that Mandel and Roulston founded, now called MidTown Cleveland Inc., believes the district is ready to become a real neighborhood with stores and apartments for a generation that wants to live near where they work. The group recently implemented a new strategic plan to lay the groundwork for achieving that vision. "I think what we are talking about is pulling elements of downtown east and elements of University Circle west and creating this unique stew in the middle," said Jeff Epstein, who became executive director of MidTown Cleveland in March of last year. "That's where we're going, and we're really excited about trying to weave all these disparate parts together into a vibrant neighborhood." Although executing the vision of Midtown Epstein talks about is challenging, the district has some advantages. Not only is it between the two largest employment centers in the region — downtown Cleveland and University Circle — but it is a part of the Health-Tech Corridor (HTC), one of several of former Gov. Ted Strickland's "hubs of opportunity and innovation" around the state. Larger than Midtown, the HTC runs from Cleveland State University in downtown on the west and the medical centers of University Circle on the east. But by being within the corridor, health and medical projects within Midtown are eligible for special state development grants and loans that spur development. Created in 2010, the corridor status attracted Streetsboro's Geis Cos., which that year began the first phase of Midtown Tech Park. Epstein said the district has seen $147 million in real estate development between 2008 and 2015. Epstein also believes the HealthLine bus rapid transit, which has been running since 2008 and offers future Midtown residents easy commutes to downtown or University Circle, will help his group knit together a neighborhood. "Everybody sees the development, but people still see (Midtown) as a pass-through," said Epstein, who had been the executive director of HTC. "When you ask people to envision the future of what they want this place to be, there was almost an inability to do it. We said to ourselves, the ingredients of a neighborhood are here. They just need to be pulled together." Perhaps the most significant recent redevelopment in the district has been the move of the headquarters of Dealer Tire LLC, a tire distributor, into the long-vacant Victory Center at East 71st Street and Euclid. Dealer Tire moved 450 employees into the building earlier this year, with an additional 100 employees likely to be added. With more job growth on the horizon, MidTown Cleveland is committed to helping employers hire from the surrounding neighborhoods. "Jobs are growing and we still have massive unemployment around us," Epstein said. "We've started looking at creative models, and we're encouraging businesses and nonprofits to hire locally, and we're pairing up with workforce organizations to help with that." Epstein said he is looking at a successful program at University Hospitals as one model. Barney Taxel, owner of the Taxel Image Group, a photographic business that has been in the district for decades, is happy to see the redevelopment, though he noted the idea of the district that includes Euclid Avenue becoming a place to live and not just to work is really just coming full circle. "There always has been residential in this area," he said. He added, "We had Millionaires' Row," recalling the string of mansions along Euclid that included the home of John D. Rockefeller at the corner of Euclid and East 40th Street. 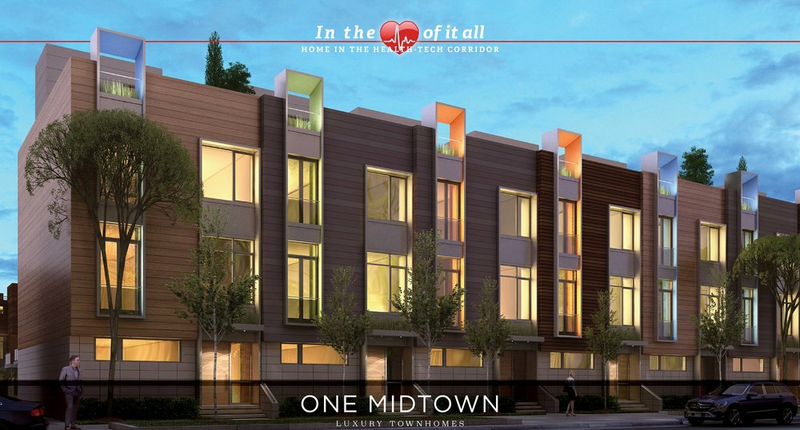 One Midtown Luxury Townhomes - Zachary Nicolay, 216-973-6484, Keller Williams Greater Cleveland.